Creating Gem Elixirs - It's Easy & Exciting! "Creating Gem Elixirs - Create Your Own & Heal!" Creating Gem Elixirs are really easy and exciting. It is however extremely important for you to choose and use the correct crystals. When you use crystals externally by either wearing or carrying them or doing a crystal healing session, should you experience any adverse effect from these crystals you would be able to remove them quickly and easily. It is however very different when you take crystal gem elixirs. Because they are taken internally, you will be subjected to their effects for however long it takes them to work out of your system the same way you would be affected when taking any other medication orally so checking for the toxicity of a crystal is vital. Learn how creating Gem Elixirs can improve your well-being and add these powerful healing tools to your healing toolbox. "Use Gem Elixirs ... They Work!" Creating Gem Elixirs and using these highly versatile healing tools in your healing routine adds a very exciting and effective dimension to your abilities as a healer, your abilities with crystal healing will be greatly enhanced. Refill your dropper or spray bottle from the mother essence as required. Keep the stock bottle in a cool, dark place. When creating gem elixirs, only use sufficiently hard, non-water soluble, non-toxic stones. Members of the quartz family are ideal. If you are in doubt whether a stone belongs to the quartz family, check a mineralogical textbook. 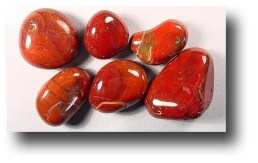 Realgar, Orpiment is arsenic, Stibnite, Galena, Copper which would include Azurite and Malachite or other compounds of Mercury, Arsenic or Lead and Cinnabar as it contains Mercury. See a more complete list of Potentially Toxic or Harmful Stones for Gem Elixirs, Gem Waters, Massage Oils, etc. "To Dilute Or Not Dilute?" Remember to check for toxicity before deciding to make gem essences by the Direct Method. If in doubt use the Double Container Method. All gem elixirs can be used either undiluted or diluted. The term "diluting" may be somewhat confusing because adding water to the mother essence or stock does not reduce the quality or effectiveness of the elixir, a matter of opinion, trust you intuition and do what you feel is right for you. Whether you use the elixirs diluted or undiluted is your choice. Some people feel that you benefit best from the undiluted elixir for the first month and thereafter the elixir can be diluted. My advice is to use your intuition and decide for yourself although it is my belief that less is more. You can use muscle testing or a pendulum to help with evaluating the potential usefulness of gem elixirs as well as meditation and intuition. 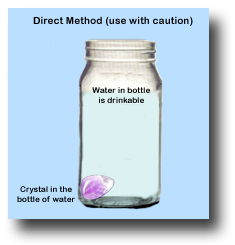 "Creating Gem Elixirs - The Direct Method"
This method of creating gem elixirs should only be used for the Quartz crystal family and I would suggest using only polished stones. You should however always check the stones toxicity before using this method. The Quartz family is non-toxic non-porous and they therefore are safe to immerse in water. You should have a calm and focused emotional state while making crystal essences because strong emotions can affect the elixir. Cover a cleansed quartz crystal with spring, distilled or bottled water in a clear glass bowl and place in full sunlight for two to three hours. It is important that you minimize direct physical contact with the crystals and water to prevent the crystal energy from absorbing your own energy and affecting the elixir. Remove the stones with a spoon. Pour the charged water, mother essence or stock, into a dark glass bottle, blue or brown works well. Mix with an equal amount of pure vodka of at least 40% alcohol (US 80 proof) which will act as a preservative and also help to "fix" the vibration. Seal the bottle. Vinegar can be used as a substitute for the alcohol. Carefully decant small amounts of the mother crystal essence into a smaller dark glass bottle with a dropper. Another exciting way to make Gem elixirs is to use seashells, amber or petrified wood. This would be using elements that would be classified as being organic of origin. "Creating Gem Elixirs - The Indirect Or Double Container Method"
You should have a calm and focused emotional state while creating gem elixirs because strong emotions can affect the elixir. 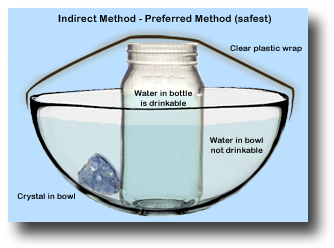 Place your crystal in a small sealed glass container which you will then place in a larger glass container of water and place six of the same crystals around the container being charged. Instead of the six crystals around the container you can also use Clear Quartz points, points facing inwards, to amplify and direct the energy of the crystal you are making an elixir with into the water. Leave the container in direct sunlight for +- four hours. It is important to minimize direct physical contact with the crystals and water in order to keep the crystal energy from absorbing your own energy and affecting the elixir so you may wish to remove the sealed glass container holding the gems with tongs or a spoon. Pour the charged water, mother essence or stock, into a dark glass bottle, blue or brown work well. Mix with an equal amount of pure vodka of at least 40% alcohol (US 80 proof) which will act as a preservative and also help to "fix" the vibration. Seal the bottle. Vinegar can be used as a substitute for the alcohol. Pour a small amount of the mother crystal essence into a smaller dark glass bottle with a dropper. Place a cleansed crystal or gemstone (only use non-toxic crystals) in a plain glass tumbler or pitcher. Fill with fresh spring water cover and leave overnight. In the morning remove the crystal with a spoon, and sip the water throughout the day. The water will keep in a refrigerator for a few days. This water is great for your animals and your plants. These books are especially for those of you that are not ready to do the complete Crystal Courses, "Know & Heal Yourself - Self-Healing Crystal Course" or "The Power of Quartz - A Course in Crystal Healing" or those of you that only want to deal with one section at a time. All these little gems are highly professional, downloadable in PDF format and fully illustrated in color.